Choosing a paper type for your next project is a vital step in increasing its effectiveness, and knowing the differences between paper coatings can be helpful in choosing materials. This post will give you a little bit of background knowledge, and a few tips to help you and your printer select the best paper coating for your project. Coating is when a sealant is used on paper, giving an added layer of finish. It often affects the texture and durability of the paper. It also reduces it’s ink absorbency, which can improve the crispness of the a print: an excellent attribute for a photo print with small details. Please keep in mind, there are also different kinds of extra coating you can select that are not listed here (link to paper coating blog). This blog will outline the coating that already comes on the paper and does not need to be applied during the bindery process after the printing. Gloss is a paper coating that’s shiny and ideal for enhancing the effect of photos or graphics. According to the Printing Industry Exchange, “The gloss coating reflects light rays directly back to the reader, causing the photos to appear sharper and of higher contrast.” (Printing & Design Tips: March 2004, Issue #32) Because of it’s coating, it can be hard to write on, unless you have a permanent marker or a ball point pen. 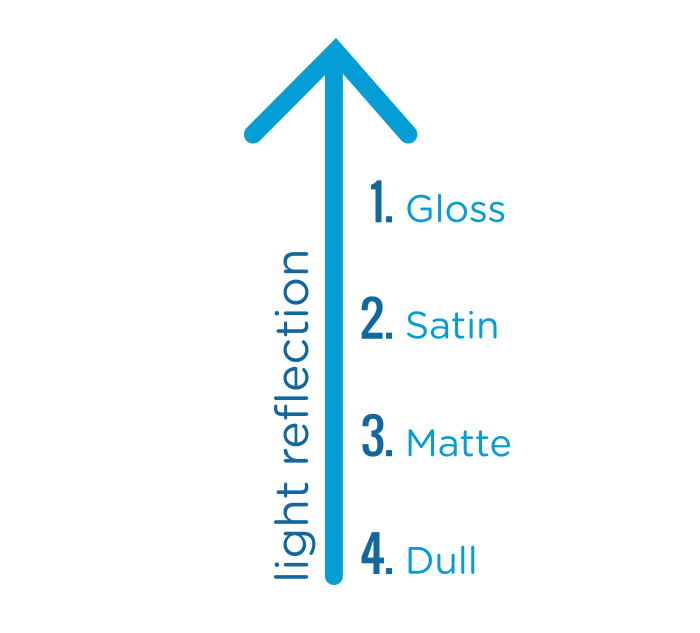 Whereas gloss has a high shine, Matte is a coated paper that does not produce this effect. Matte can also be great for photos, and is less susceptible to being smudged or holding fingerprints. It’s a great option for pieces with a large amount of text, because the light does not bounce off the paper and interfere with the content. If your Because of it’s coating, it can be hard to write on also. If you’re looking for at different paper selections, keep in mind that there are several coating types, but many will yield similar results. For instance Satin text has less shine than gloss coated paper, but more shine than matte paper. Dull coated paper has even less than matte. Often times Matte paper and uncoated paper get confused with each other. Uncoated paper is ideal for anything you’re intending to write on. Coatings can make it harder for the paper to hold ink. Since there’s no coating, the paper is natural and porous. The pores have the space to hold ink or toner instead, because they’re not being filled with coating. This is why you can write on uncoated paper with any kind of writing tool without worry of it smudging. “C1S” stands for coated on one side. This type of paper is usually glossy on one side (where the coating is), while the other side is uncoated. This is usually a popular choice for greeting cards: the gloss enhances the appearance of images or graphics, and the inside is easy to write on because there’s no coating. This is usually a good option for postcards as well. Some books have this kind of paper as a cover, since C1S paper is more commonly carried as a cover stock. If you’re looking for durability in your project, choosing a coated paper might be the way to go. Coated papers tend to last longer, and are less susceptible to picking up dirt or water. This makes them great for brochures, programs or other collateral items that might be shuffled around. When choosing a paper for your project, it’s more important that you decide whether you’d like coating or not. 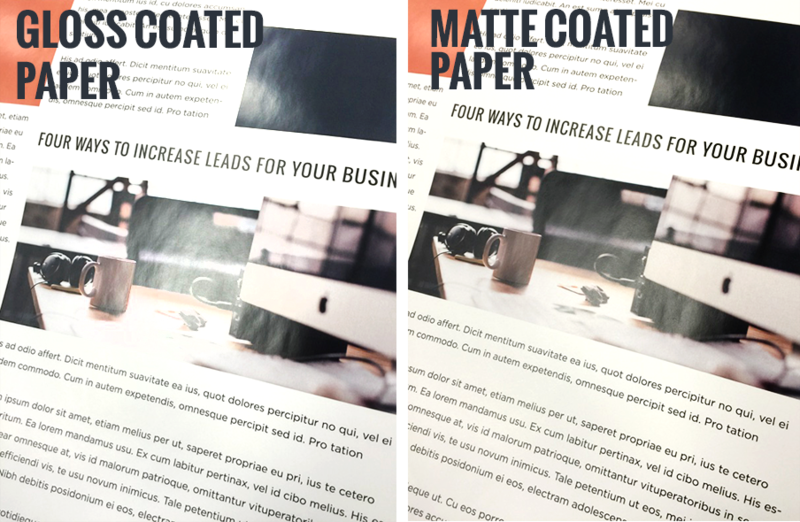 Customers often confuse matte coated paper and uncoated paper when they’re looking for something without a gloss. In actuality, matte paper is similar to gloss. In our office we carry 120# gloss cover, and 120# dull cover. When you print on both and place them side by side, it’s hard to tell the difference between the two. The only way to tell is to hold both at the same angle, and see the slight difference in how the light bounces off the paper. This is due to the ink coverage, in addition to the paper coating. Will you be writing on the item? Does your piece feature mostly images or text? What will the end user be doing with the item – viewing at a conference, trade show?